BioShocked and Amazed | 2P START! Yes we do know about BioShock, but I’d know more about it if I could get the bloody demo to work. It took a day of futility trying to download it without failing halfway through, then the unzipping and the installing. I was excited to finally play the demo 24 hours later and of course, wouldn’t you know it, it crashes. Every time. This is why I don’t like PC games so much. Time to ask Santa for a 360 for Christmas? I’m mostly frustrated because all this time I could have been practicing Mario Strikers Charged so I wouldn’t get embarrassed by Ray online! 360 is where it’s at. I couldn’t image not having one. The wii, well, it will collect dust until November. Santa’s 360 may just give you three jolly red rings. Ha! Great comic guys 🙂 I love Mario Strikers, me and my friend are always playing online (in the UK). I heard that Pro Evolution Soccer (Winning Eleven) is heading to the Wii… there is another great soccer game for me to become addicted to. Even the 360 demo took my boyfriend literally one entire overnight to download. This comic is AMAZINGLY great, Nintendo rules! Same thing happened to me. If you can make it to the graphics settings page try disabling high-detail shaders. Fixed the entire game for me. Ok, so maybe the PC version was like running your head into a wall multiple times, but the 360 version is just AWESOME…. Oh yeah, I would not expect a comic when Smash Brothers for the Wii comes out. I remember Ray would play the Gamecube version nonstop. I think at that point my Gamecube was a doorstop. 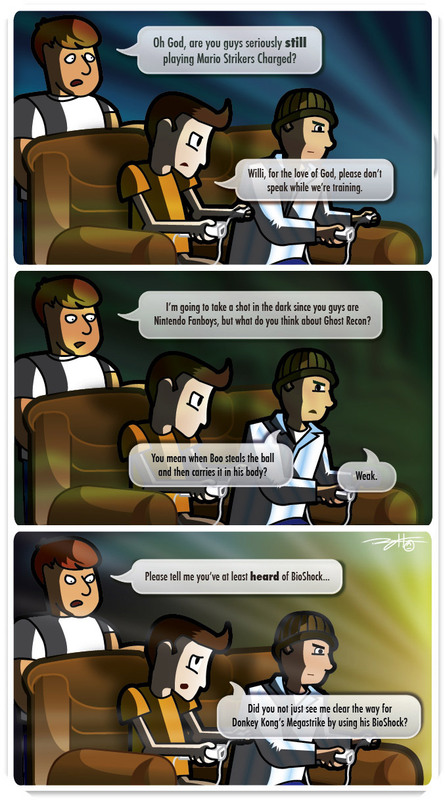 BTW, this comic is completely unrealistic, why would I be watching you play Wii when I could be playing Bioshock! Donkey kong? CLEARLY wario’s flatulance would have made a better “Bioshock” seeing as it’s a biological function! Totally jk lol! I loved the comic, dat was prty witty. Im 100% with you on the training thing, my best friend’s been trying to whip me into shape for the online multiplayer. If you see something that looks remotely like a brown squid named chelsea, dats us! Love the comic! Great idea! Why didn’t we think of that? I did consider having Ray correct Willi, telling him that it’s a GeoShock, not a BioShock, but your idea would have been even better. I’d like to apologize to you guys for being so overly critical of your guy’s comic, I’m really sorry, no hard feelings? Hmmm. That’s funny. I was able to download the demo, run the installation, install the game and then run the game just fine on my rig. Then I went to the store, bought the game, brought it home, placed the dvd in my dvd drive, install the game, run the game, and then beat the game and did not have a single problem. I wonder if this is the reason why…. .. it’s because I have a decent system to run it on. Seriously, Bioshock for PC owns. It’s every bit as good as, if not better than the 360 version.